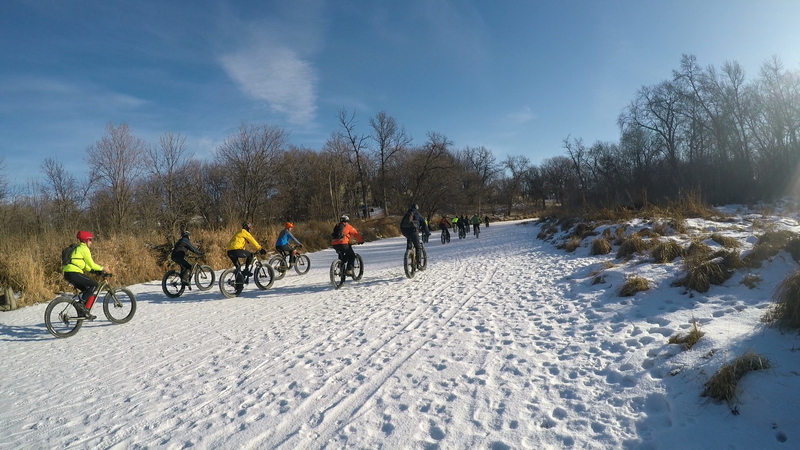 Word is that the high humidity and frigid temps were a big challenge for many (high DNF rate), but our local MB tough dudes rose to the challenge! 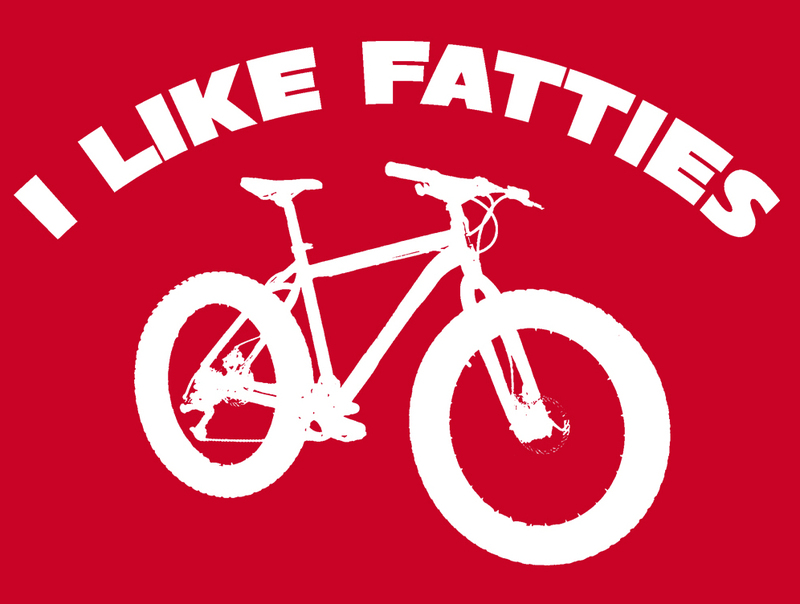 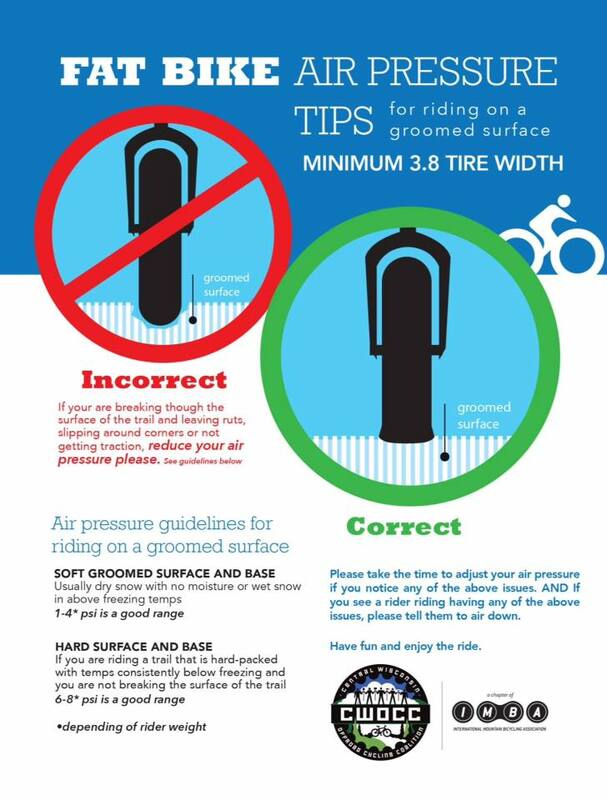 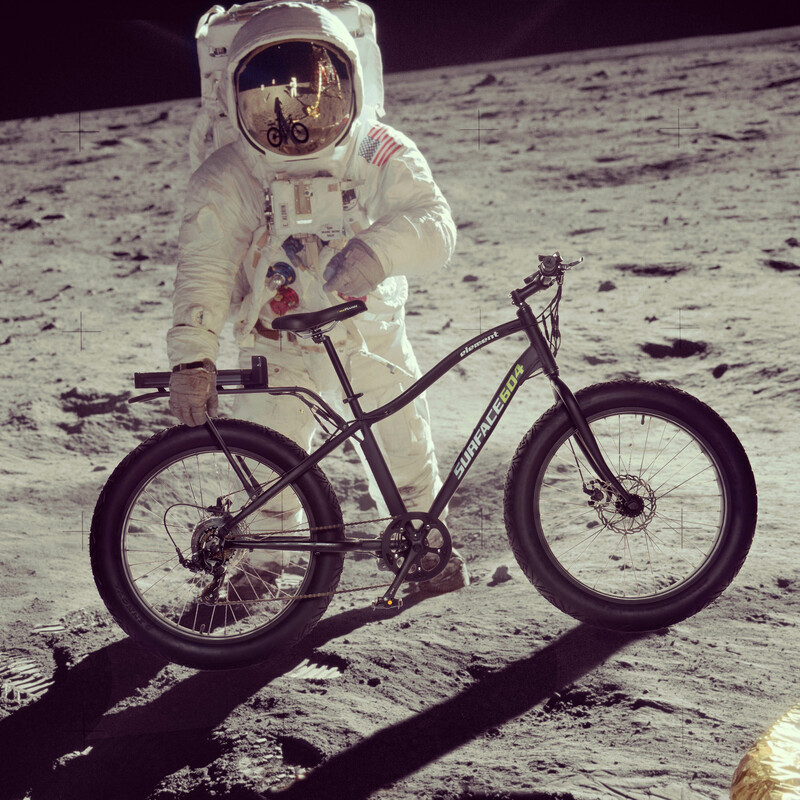 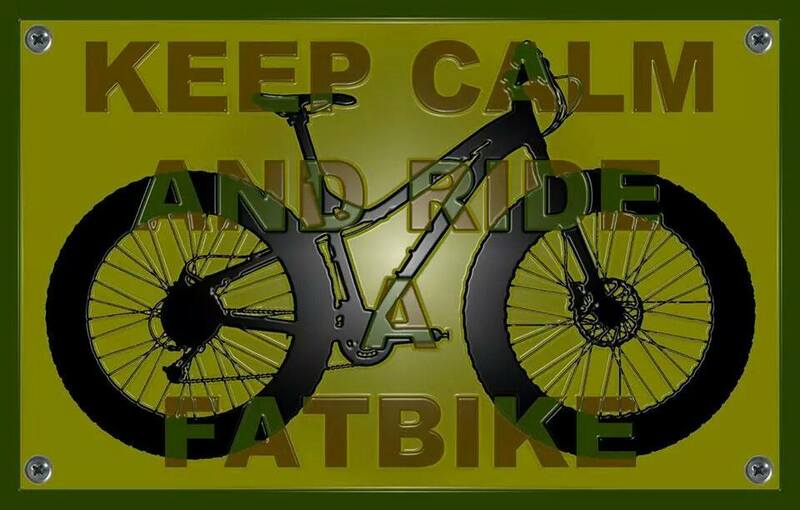 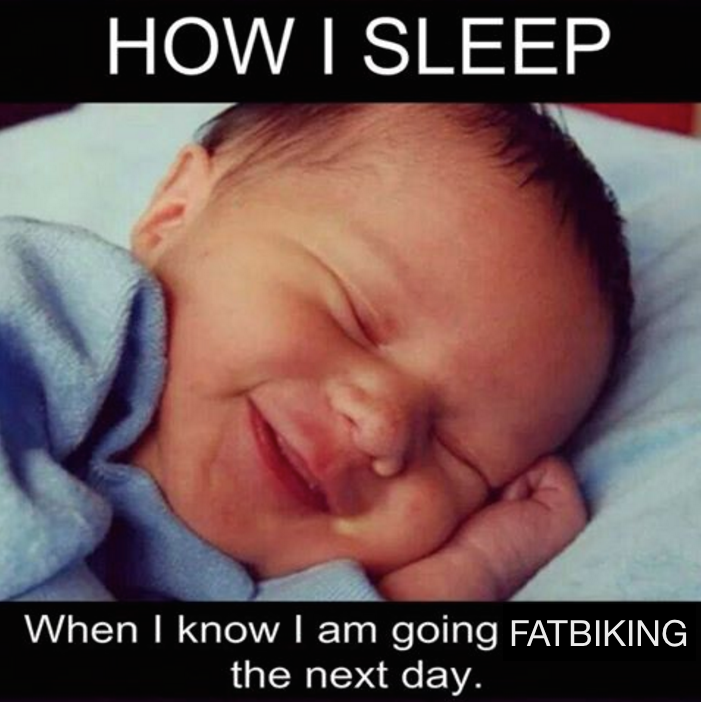 Seriously, ya need to get out to Woodcock Cycle Works on Thursday nights at 6:00 PM for a snappy and fun group fat bike ride. 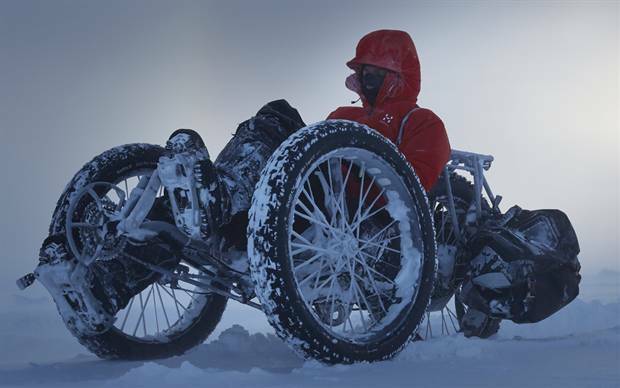 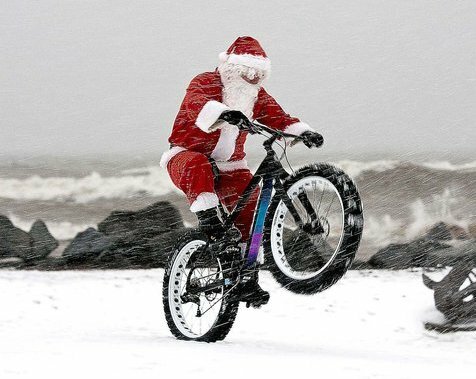 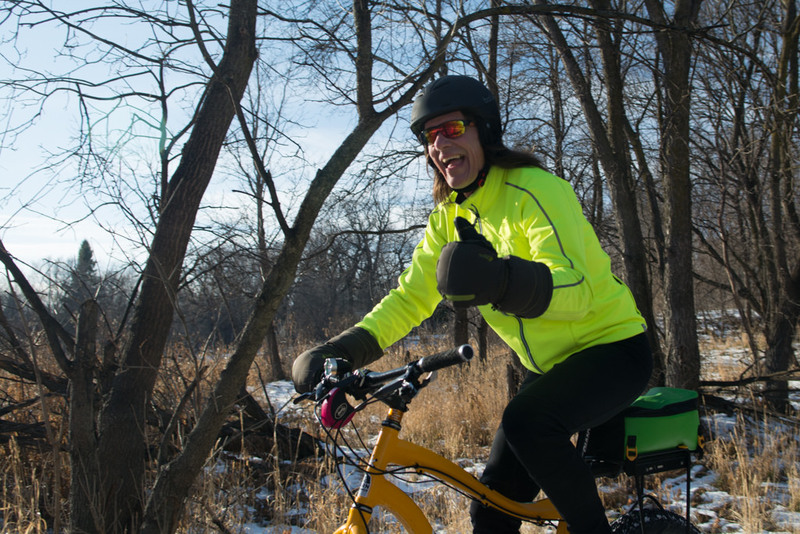 All ya need (besides a fatbike and some lights) is to be a WCW club member or have an MCA license and sign a waiver. 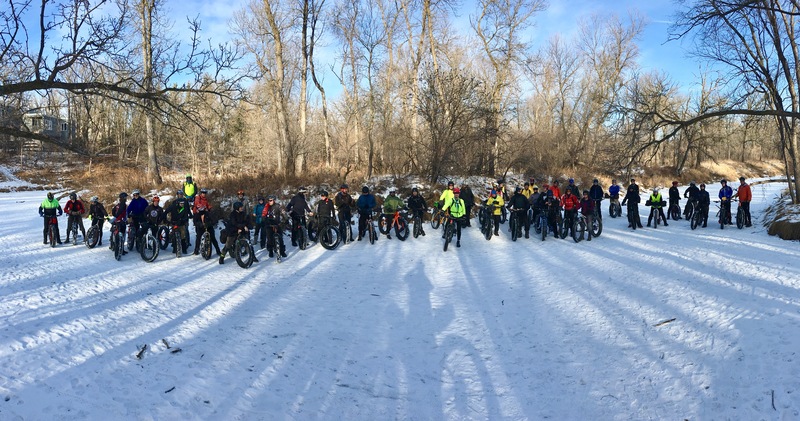 6th Annual Winnipeg GFBD Ride a HUGE success! 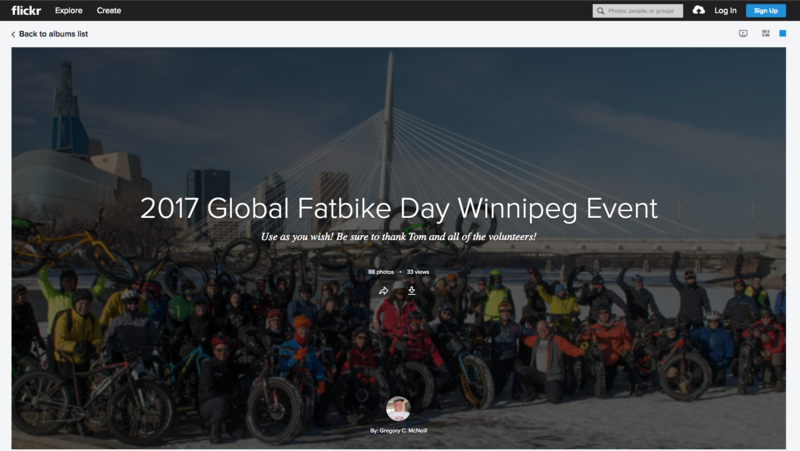 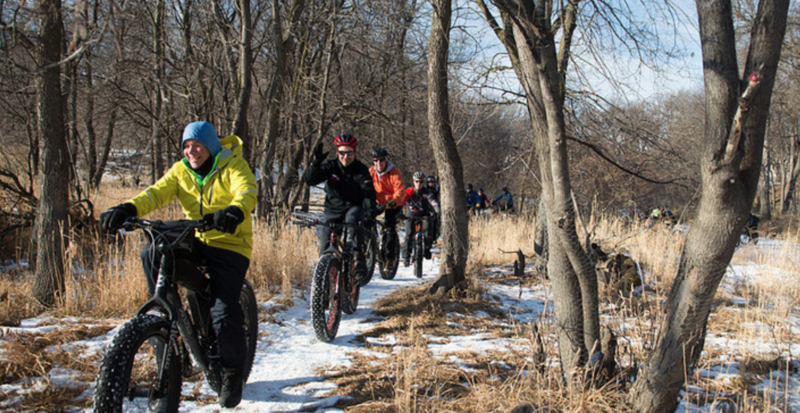 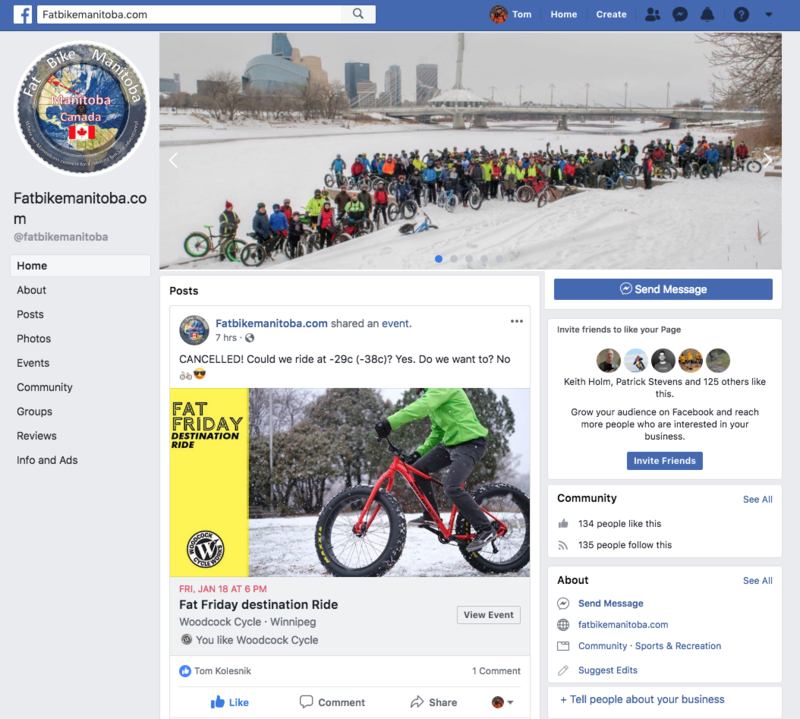 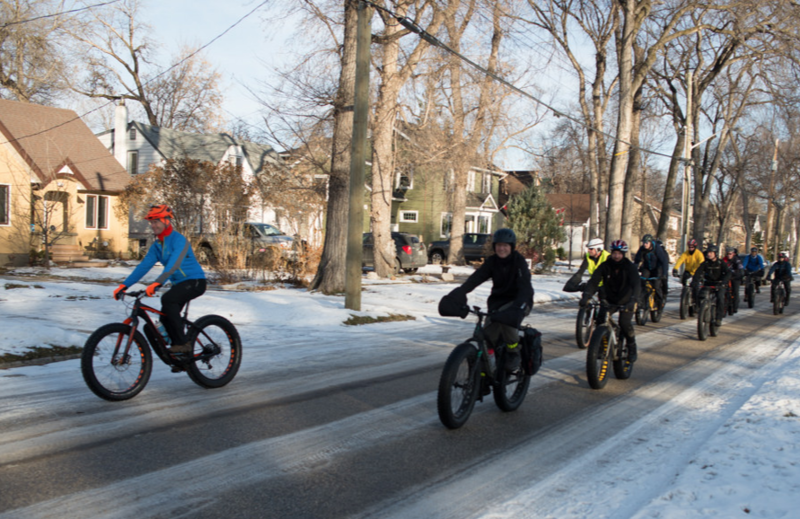 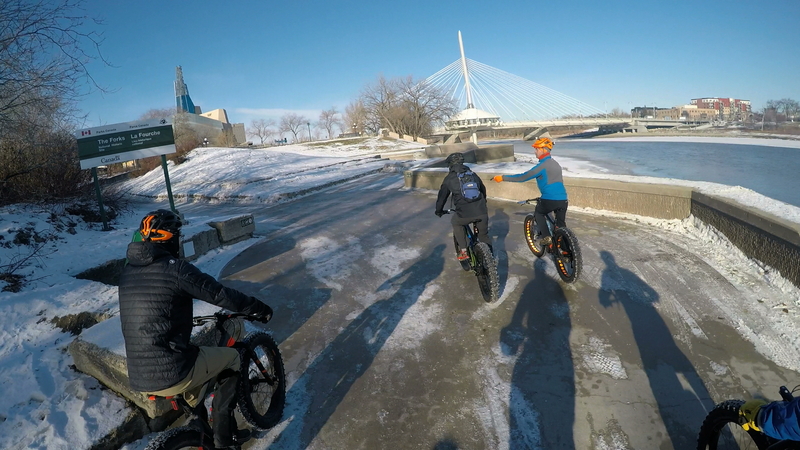 Once again our 6th Annual – 2017 Winnipeg Global Fat Bike Day Ride had more than 55+ local fatbikers out for a fun ride on trails, pathways and even the frozen Seine River, plus a chilifest get-together to swap fatbiking stories, make new friends and plan upcoming adventures! 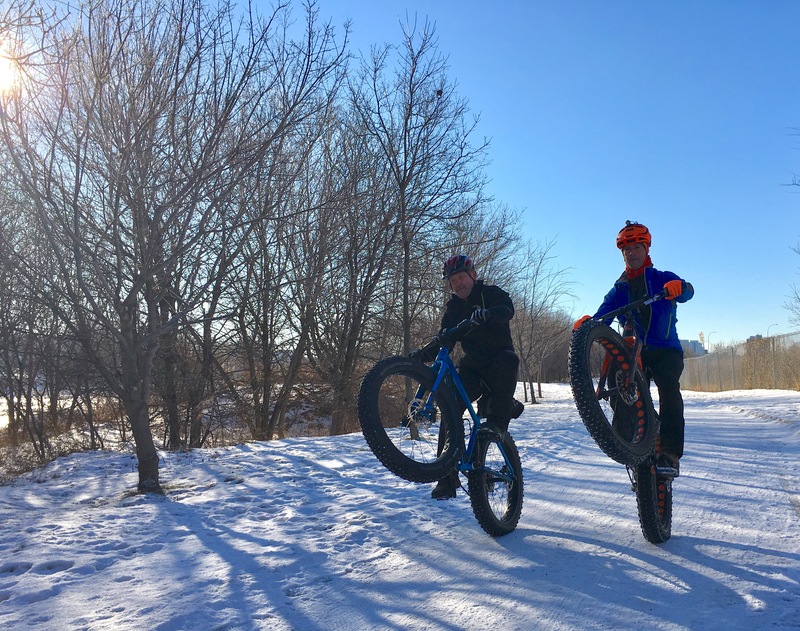 Great fun times thanks to our official photographer Gregory C. McNeill and volunteers ride guides Keith Holm, Guy Anthony and ‘Lou Fatinski’. 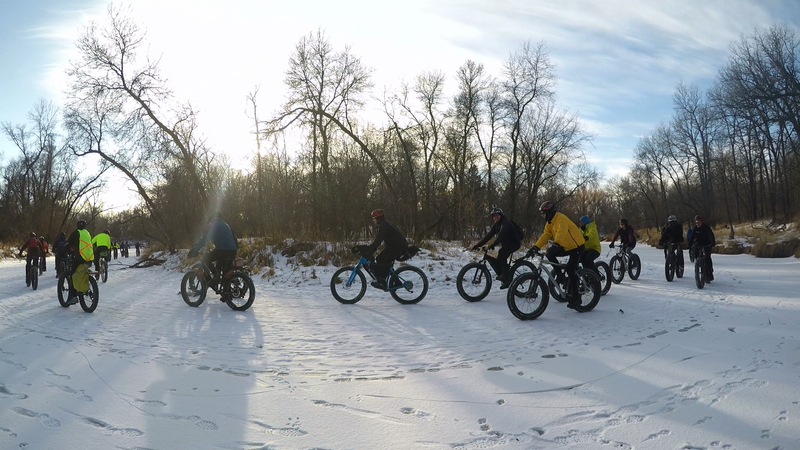 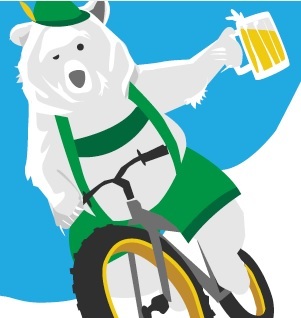 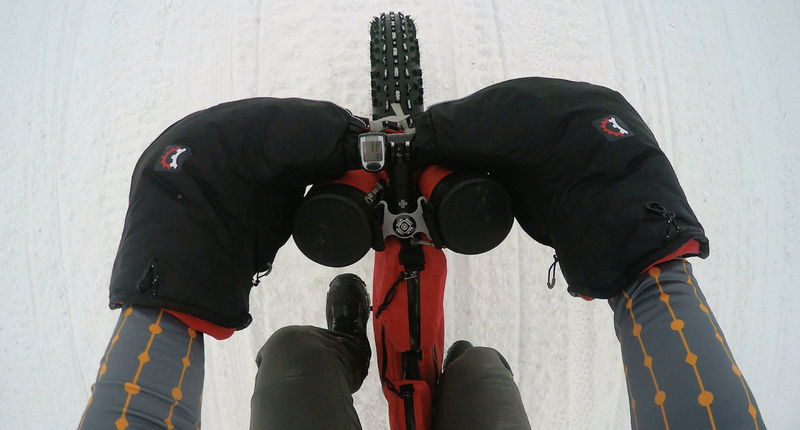 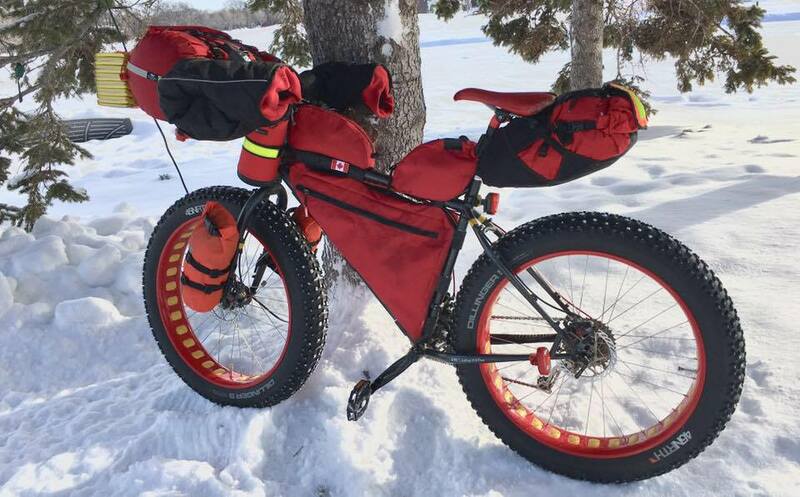 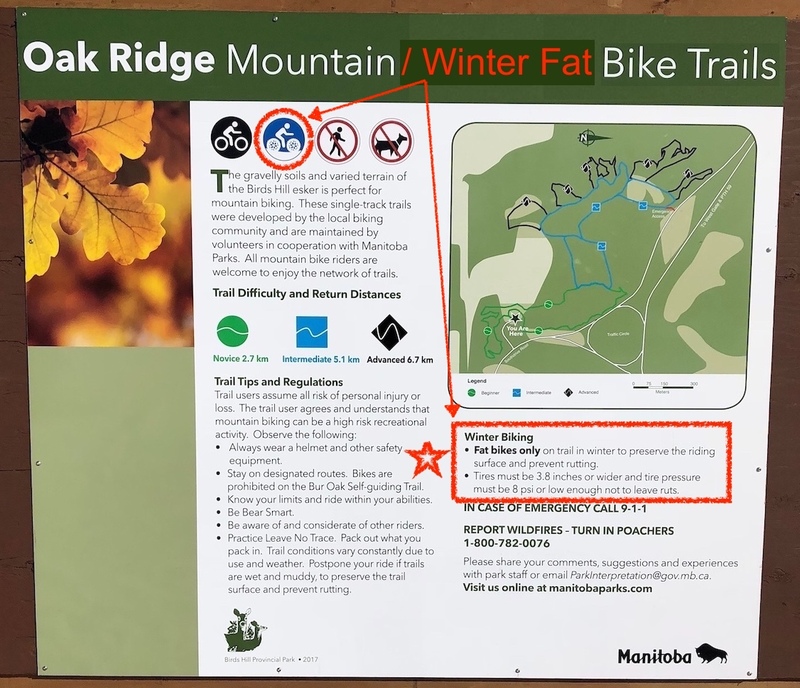 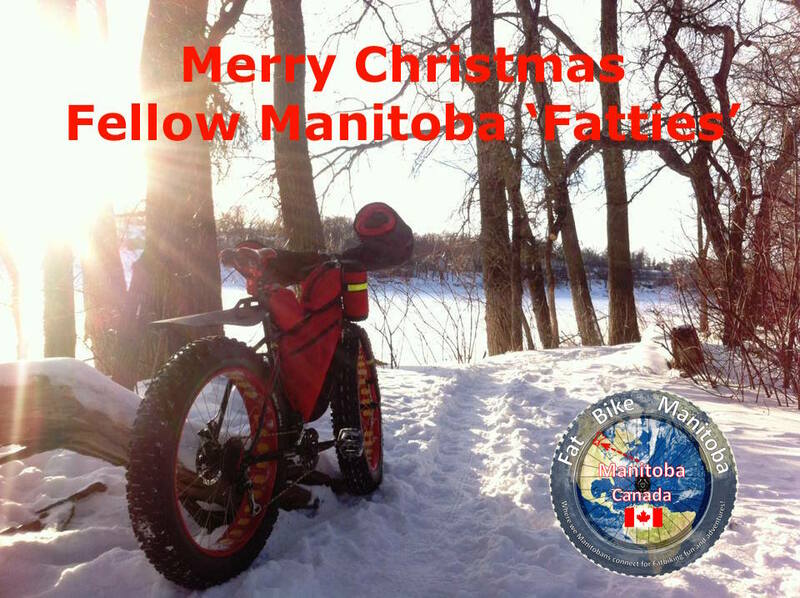 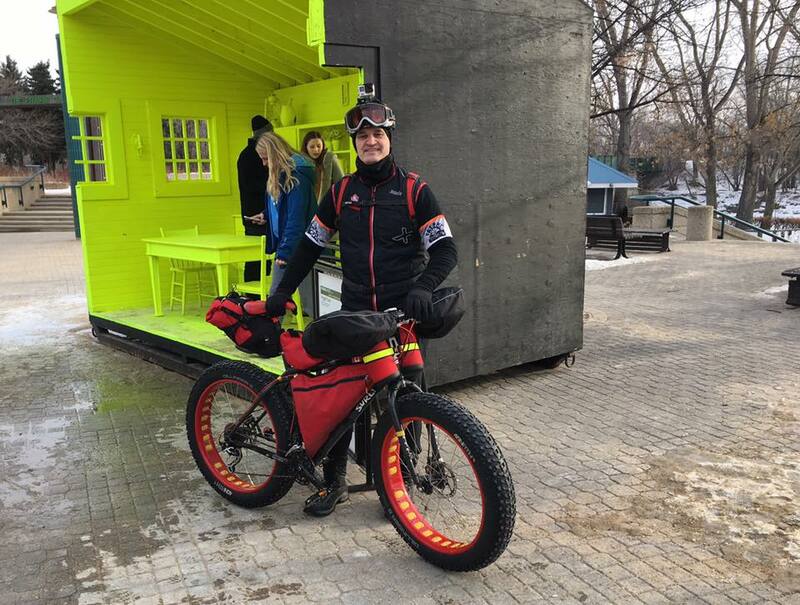 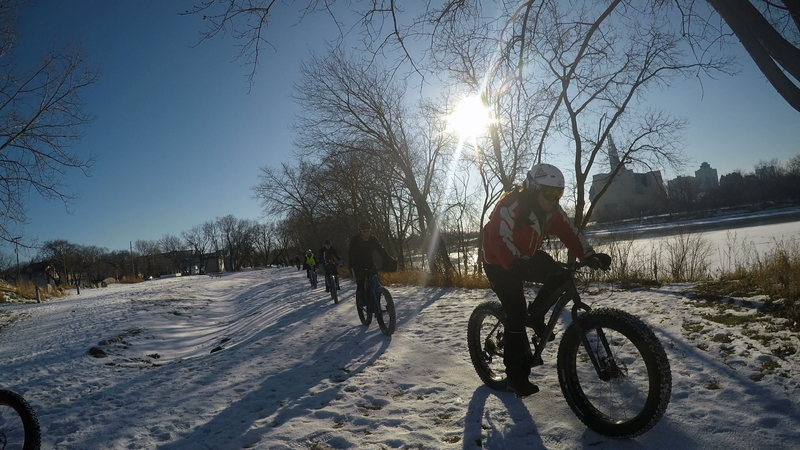 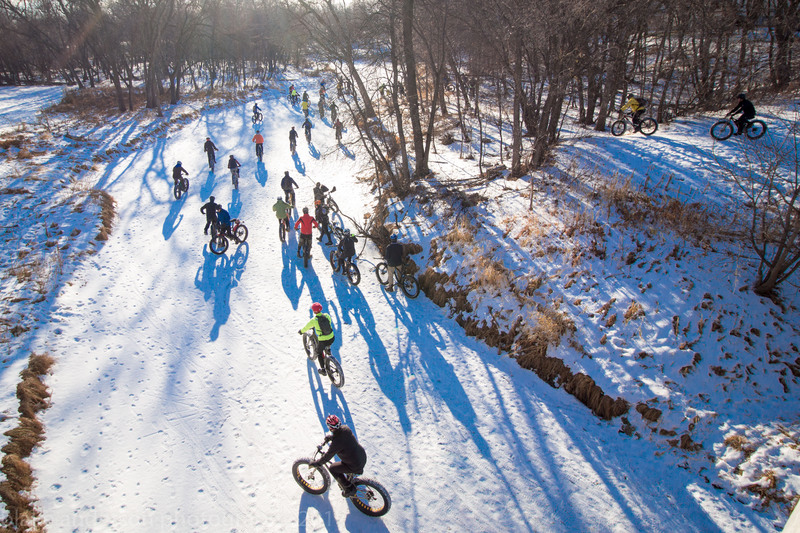 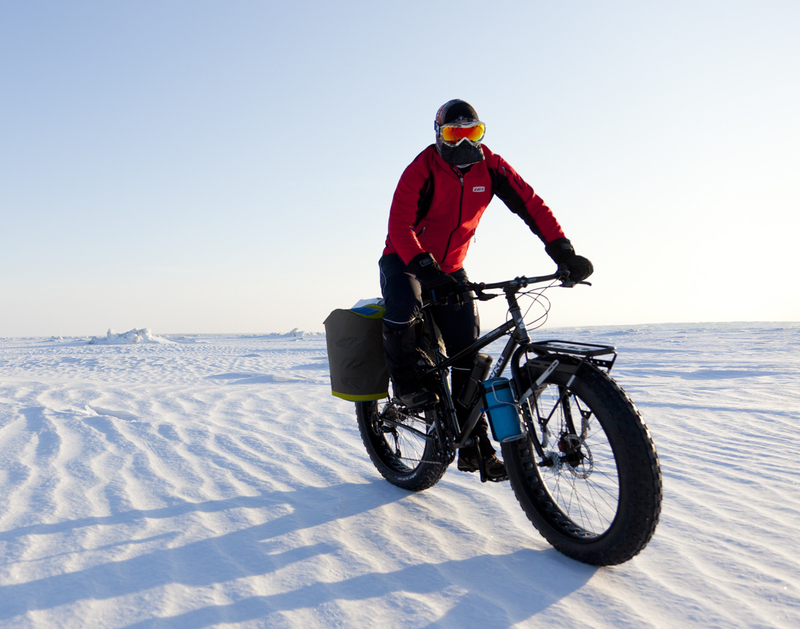 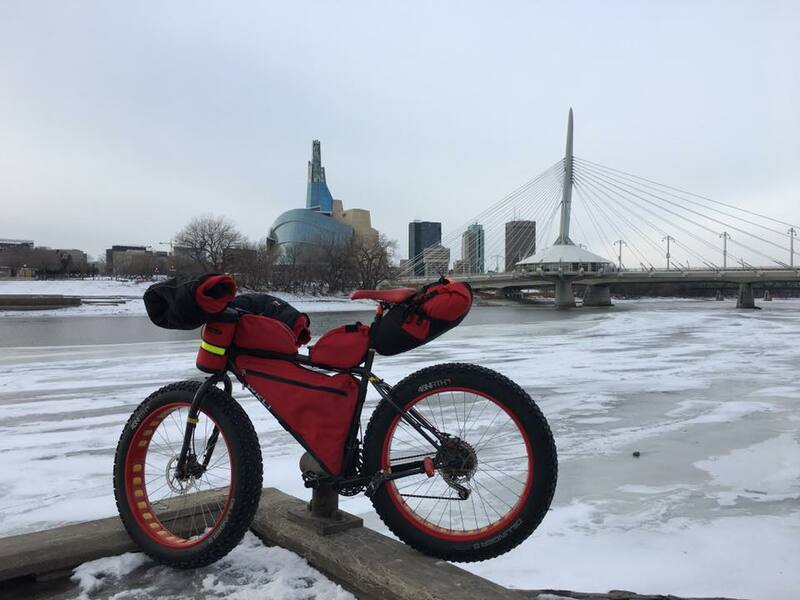 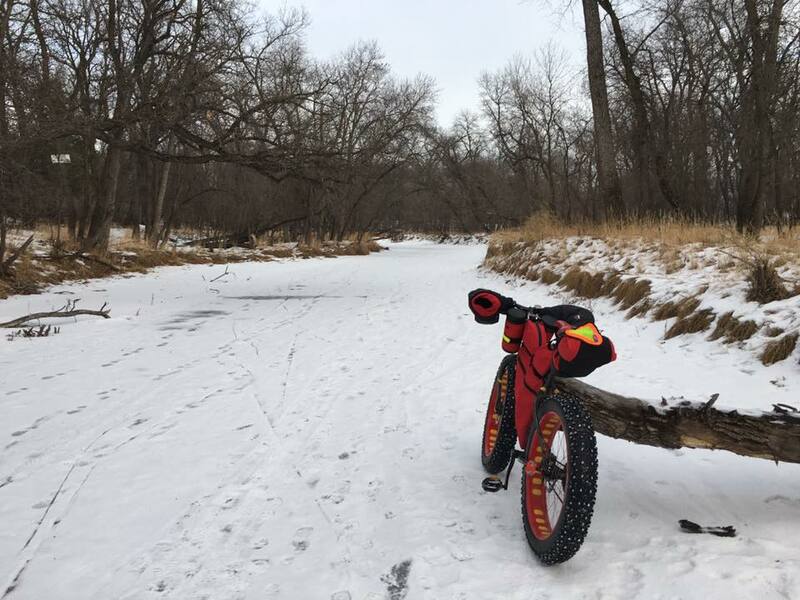 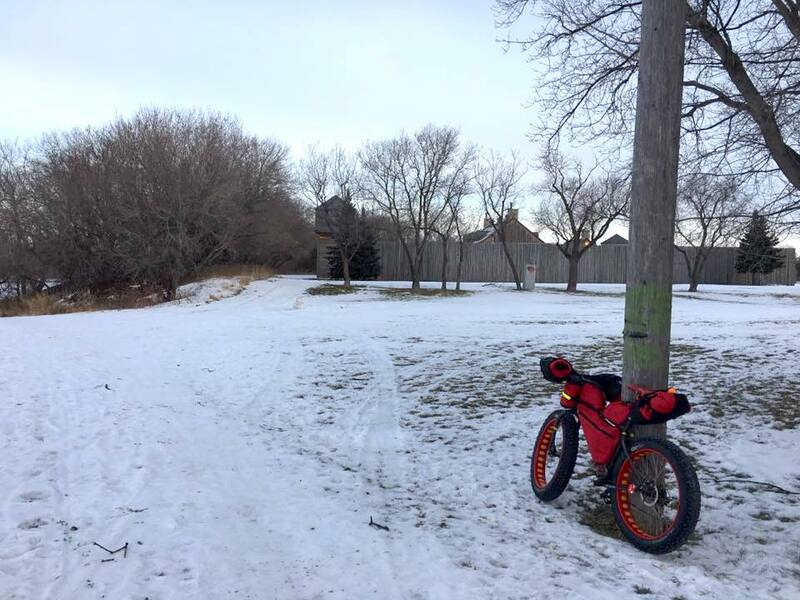 So off we rode our fatbikes down to the Red River (well okay, we did gladly welcome a few friends who didn’t have a fatbike to ride, or like Bass – had loaned his to another – nice guy). 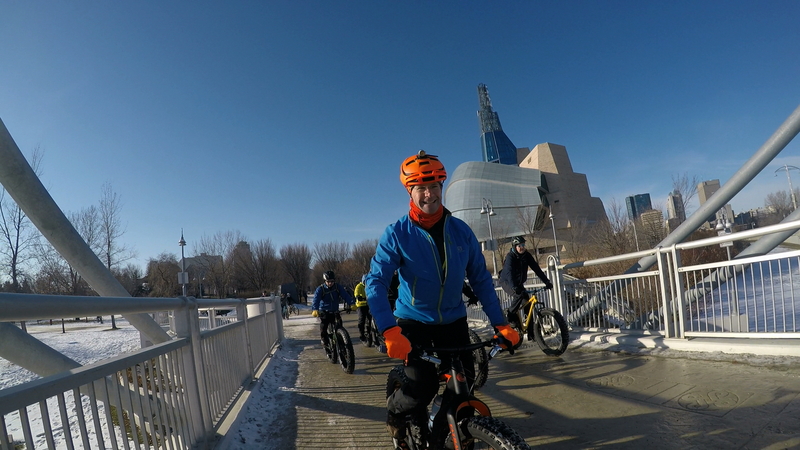 Keith Holm leads the way as we rode toward the Cdn Museum for Human Rights and the Esplanade Louis Riel Bridge. 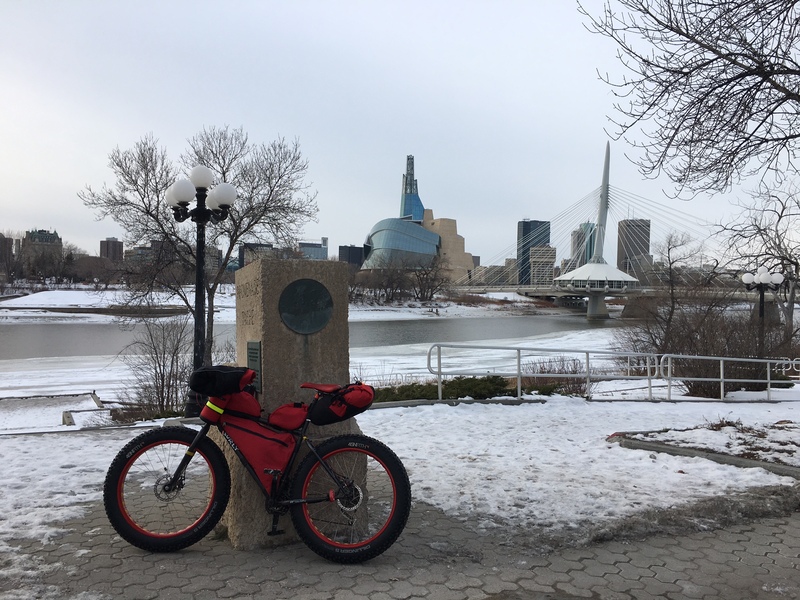 Just across from the St Boniface Cathedral we rode down to the Red River again. 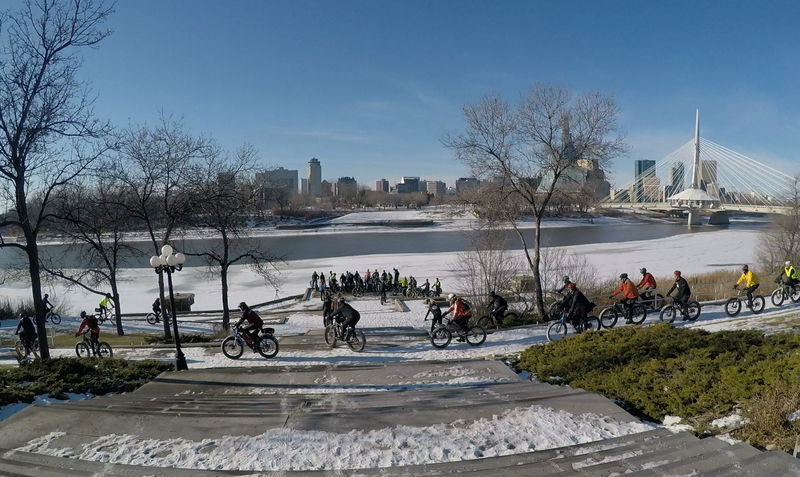 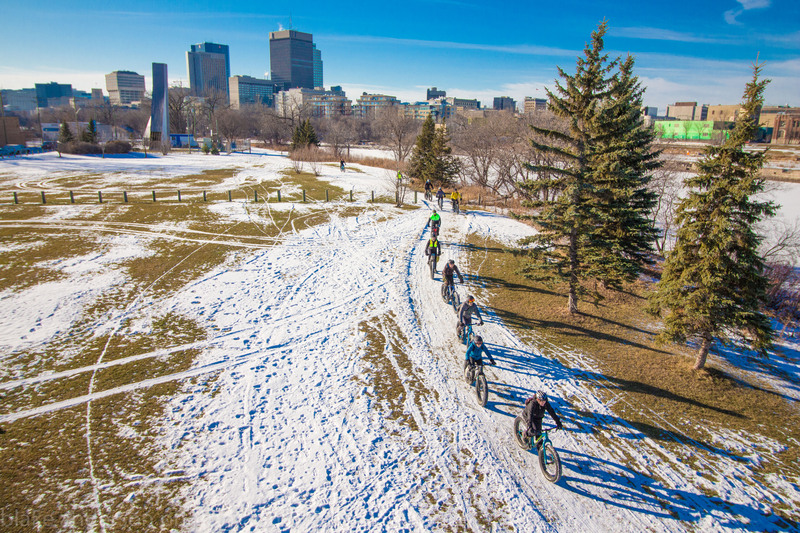 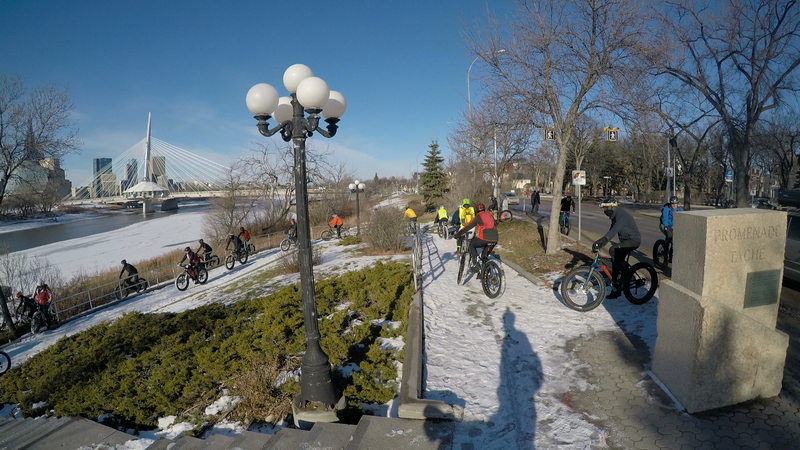 It’s quite the sight … a beautiful Winnipeg vista and 55+ Fatties riding down to our now classic GFBD photoshoot location with Gregory McNeill waiting to capture the scene. 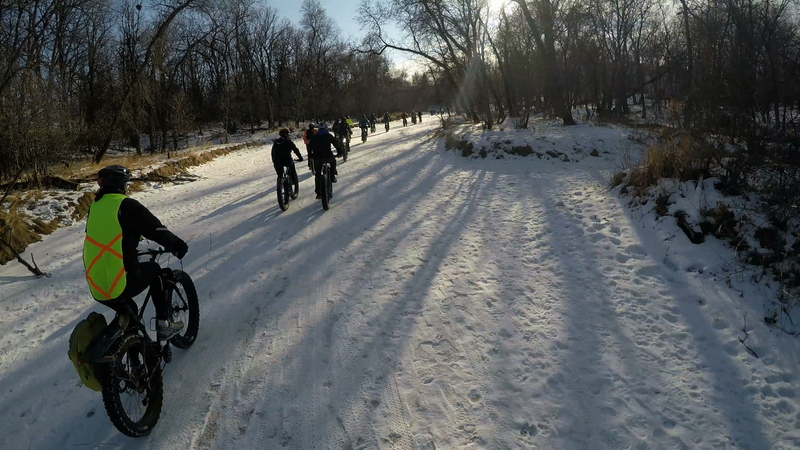 Cruising along the Red River edge trail toward Whittier Park. 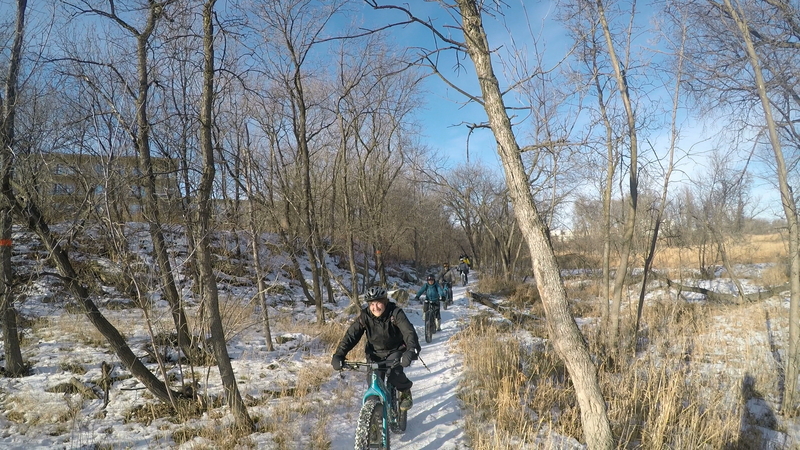 Cruising the Whittier Park trails. 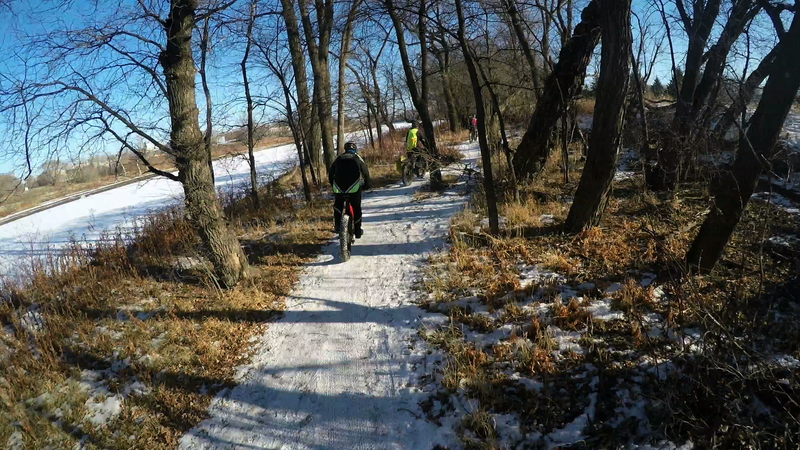 Cruising the Seine River edge trails. 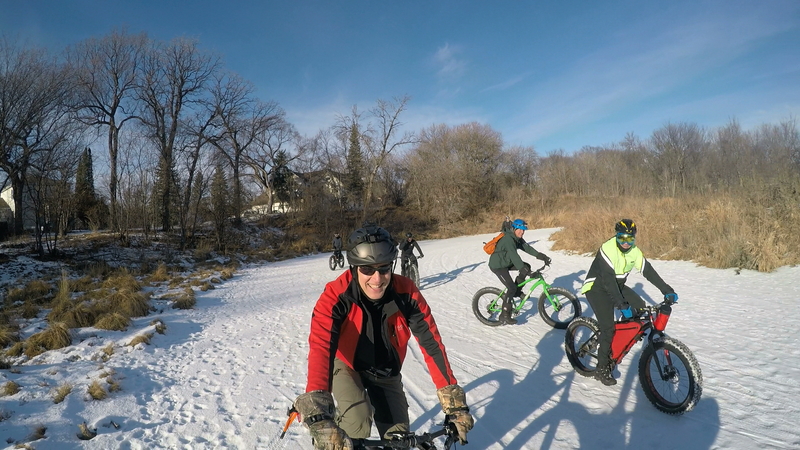 There he is … Gregory McNeill doing what he does so well … capturing pictures of us riding and making us look cool (well at least good)! 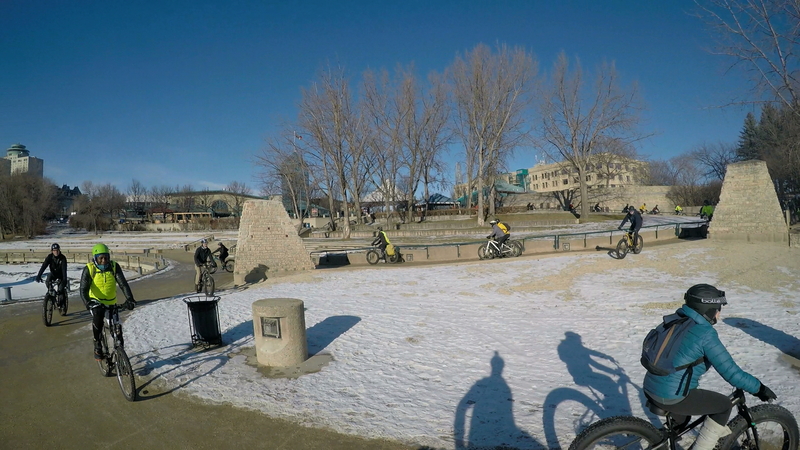 Impromptu group photo I snapped when we were finishing our sweet ride down the Seine River. 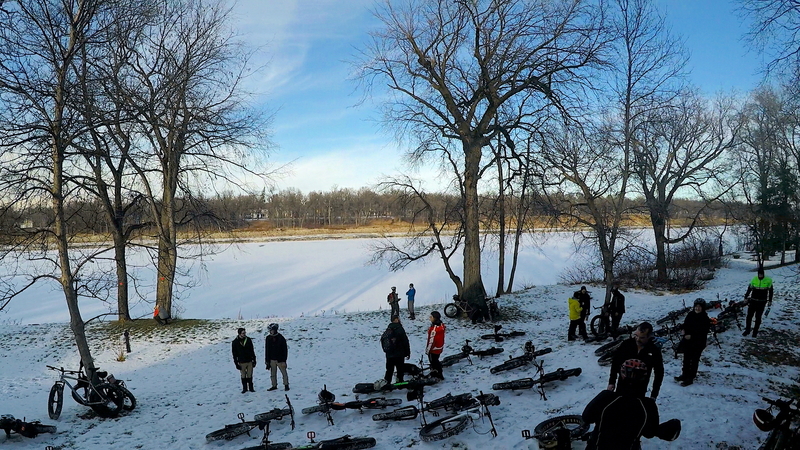 Yes – there were several fat bike parking options at our GFBD Chilifest Pitstop. 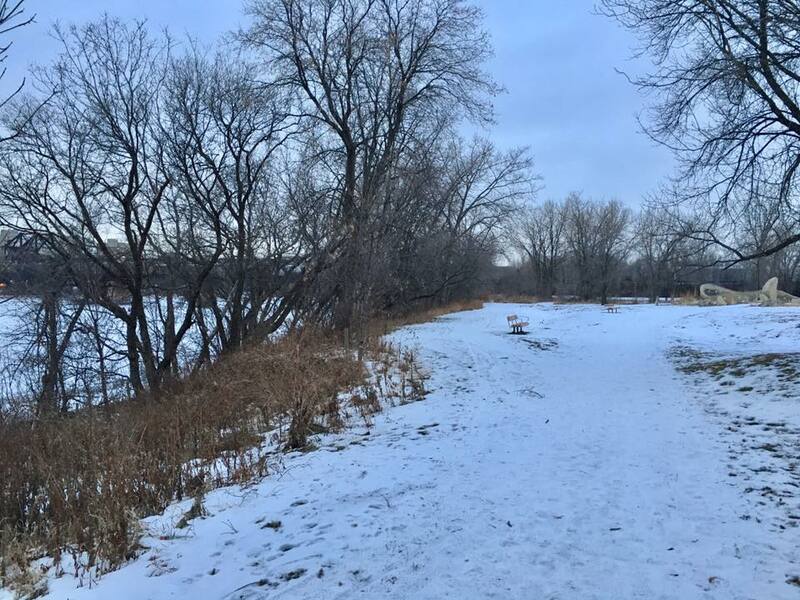 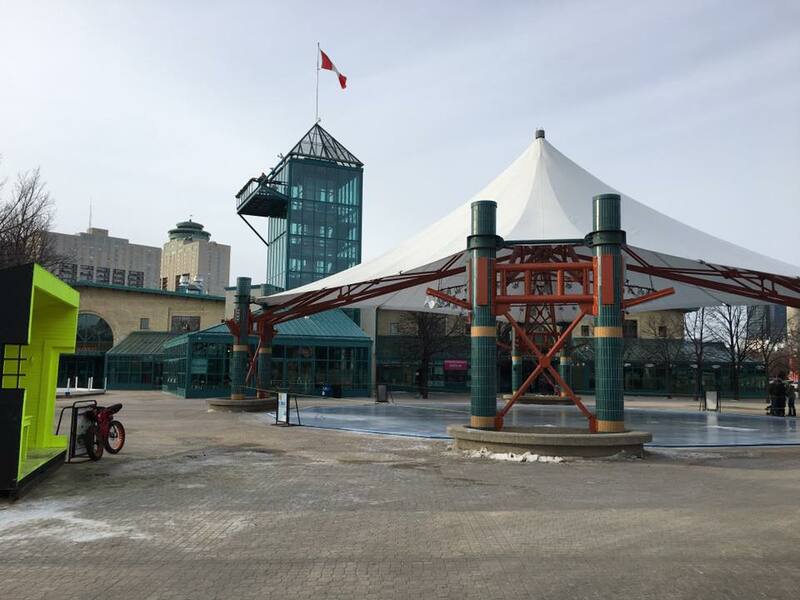 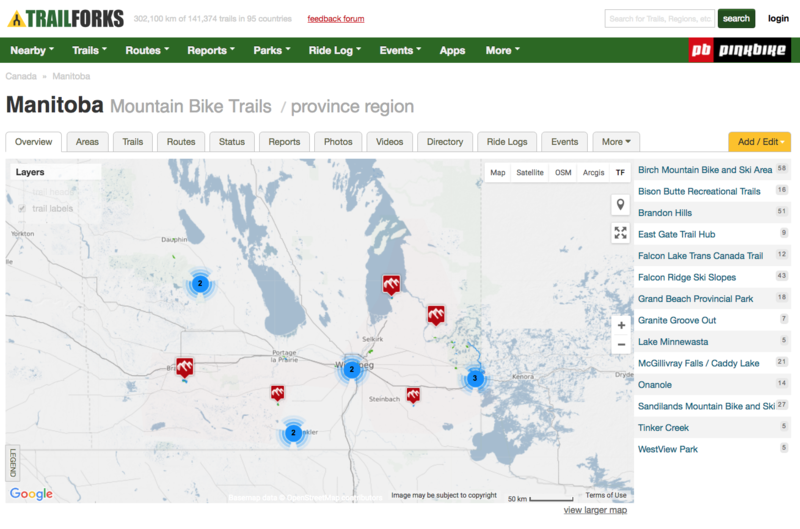 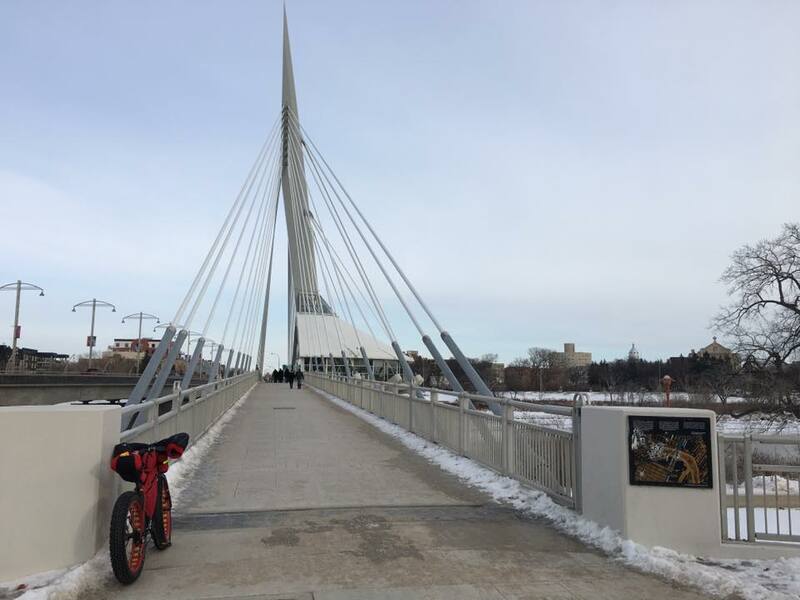 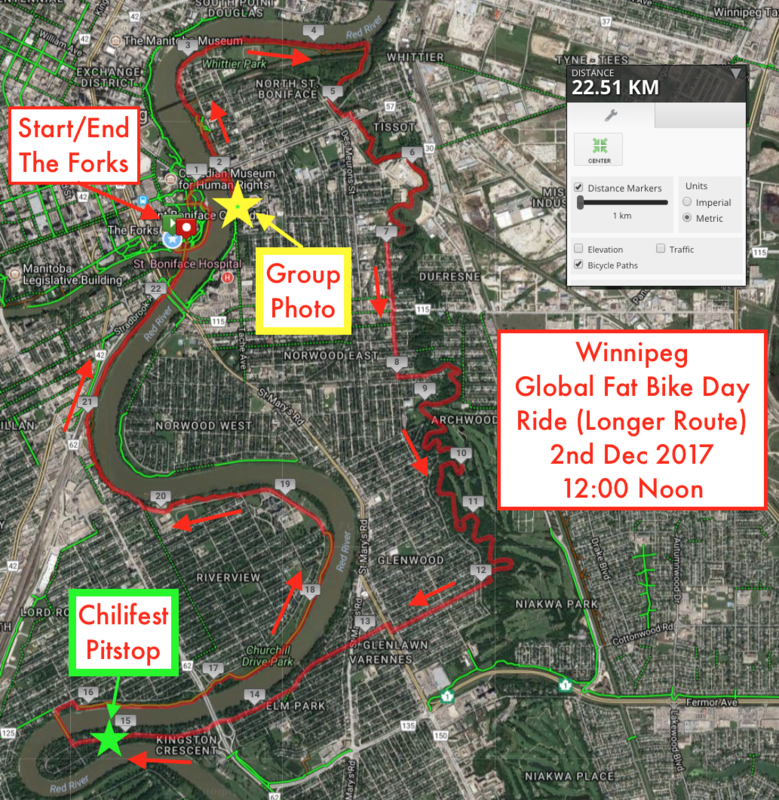 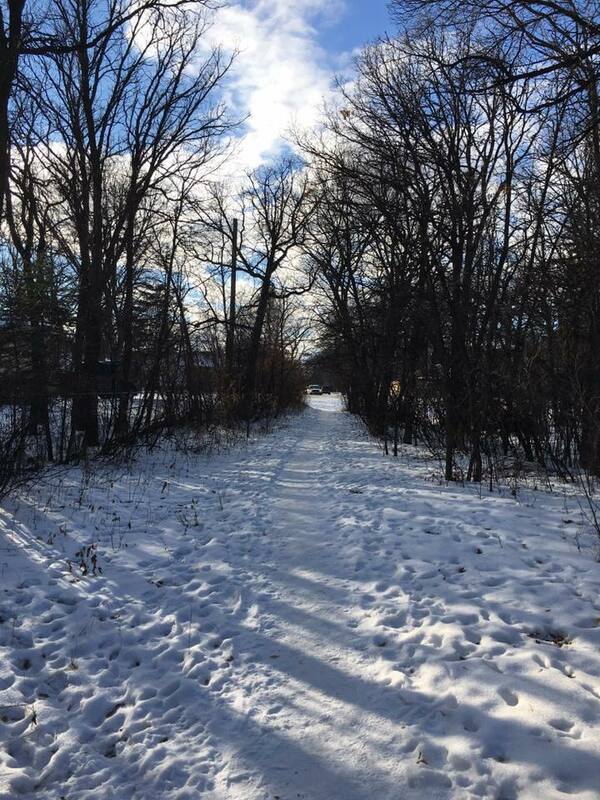 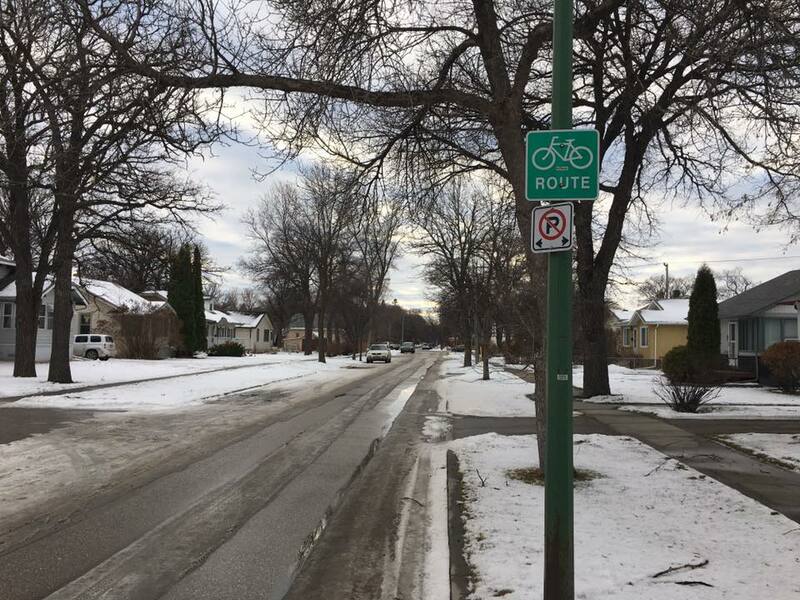 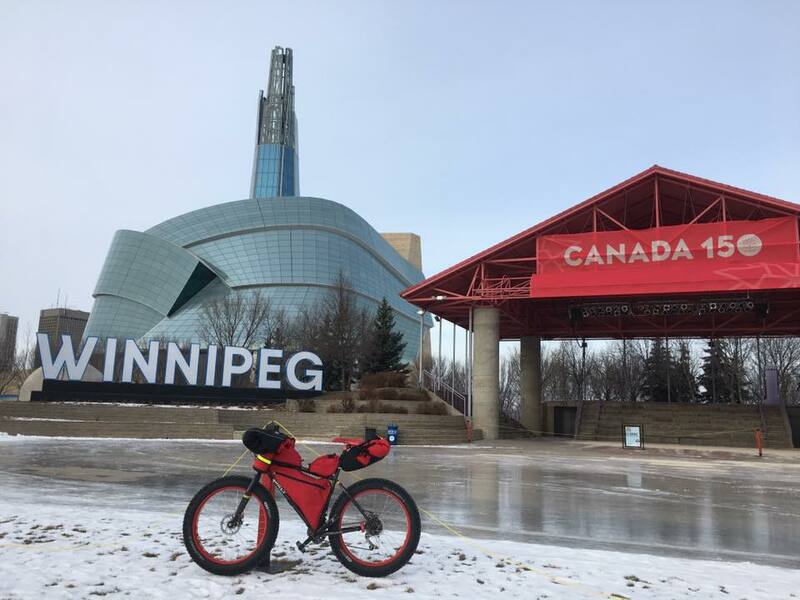 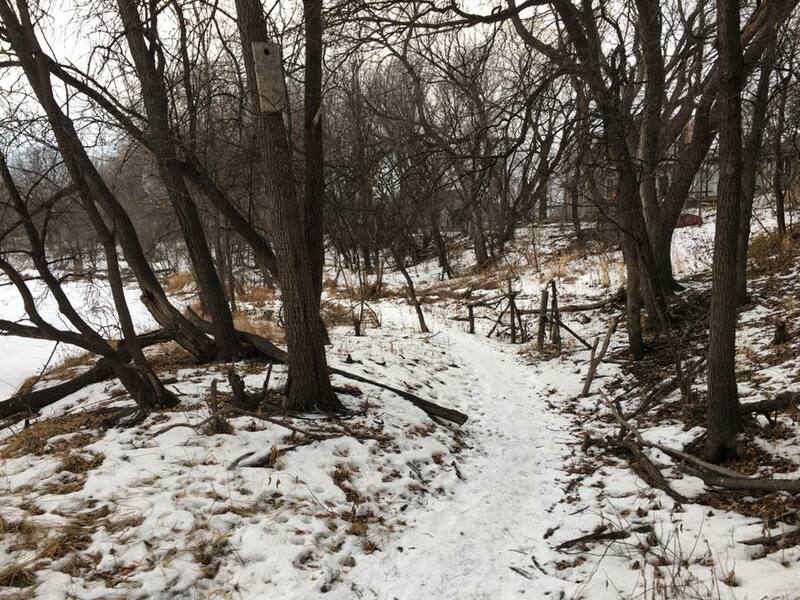 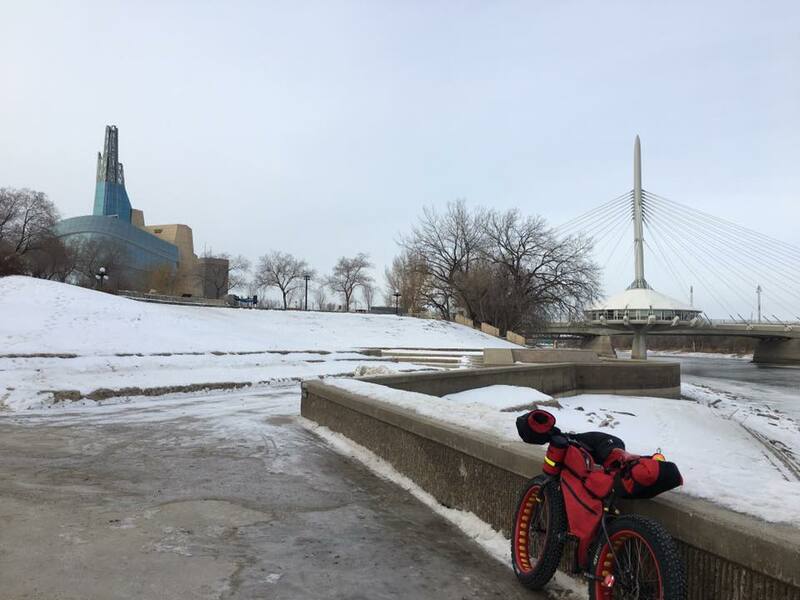 Winnipeg GFBD Ride Route Recce – It’s looking great – GIDDY UP! 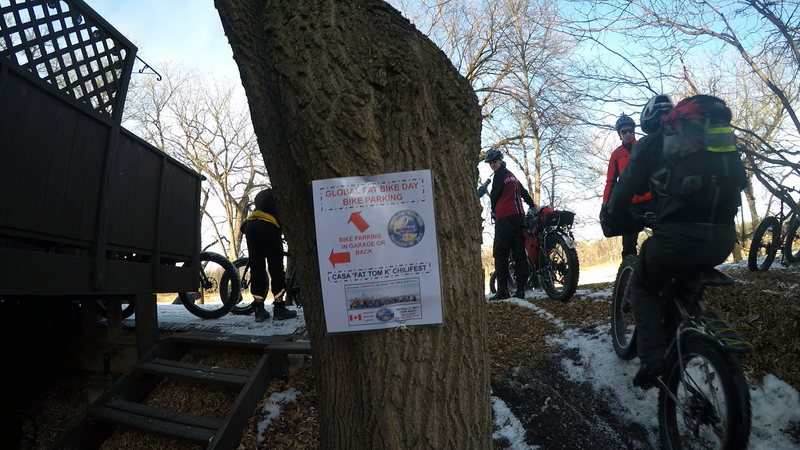 Quick feedback from my GFBD Route Recce today – IT’S LOOKING GREAT! 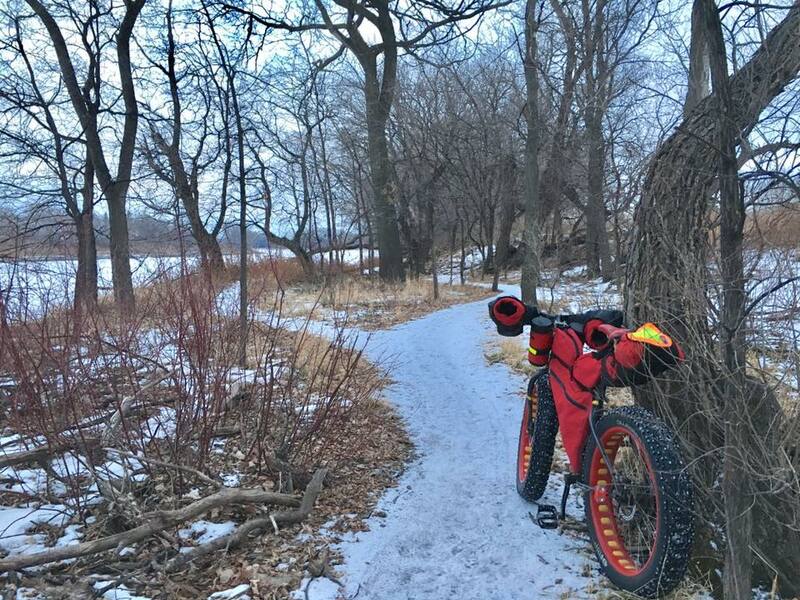 The trails, pathways, quiet roads and even the Seine River is actually better than a few days ago! 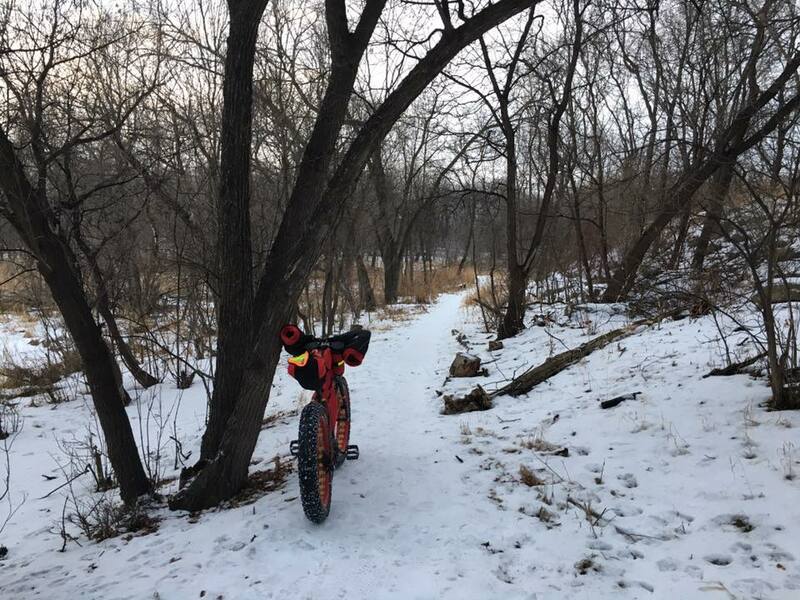 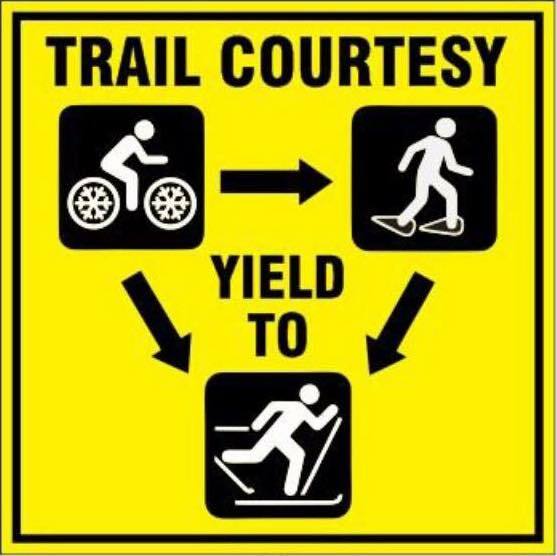 That small amount of snow we got recently has mostly bonded to the previous snow and ice to create okay conditions on the trails and paths. 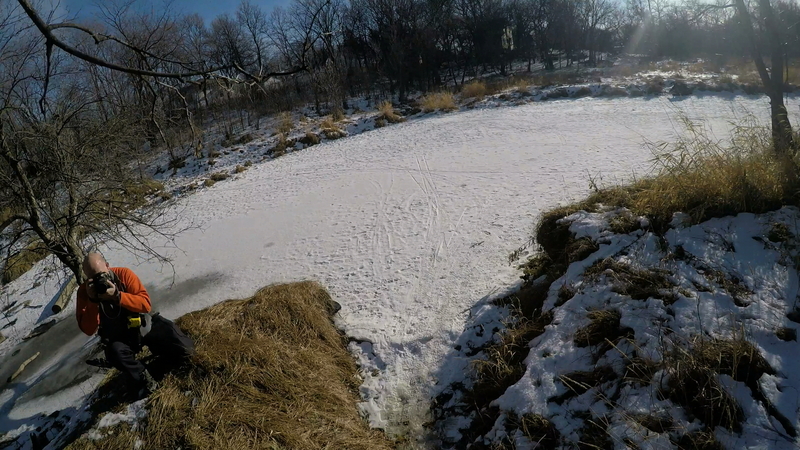 The Seine River is looking very nice! 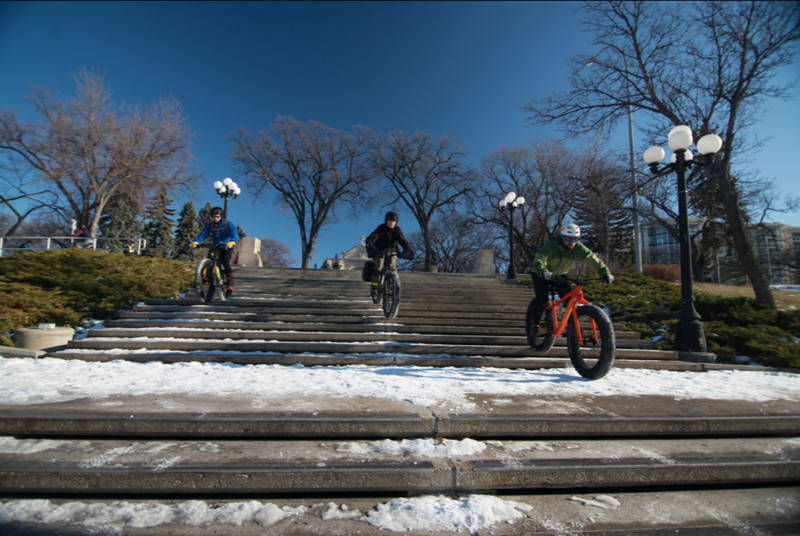 So giddy up – saddle up on your ‘Fatties’ tomorrow, join the fun at the Forks at 12:00 Noon, check out everyone bikes and make new friends! 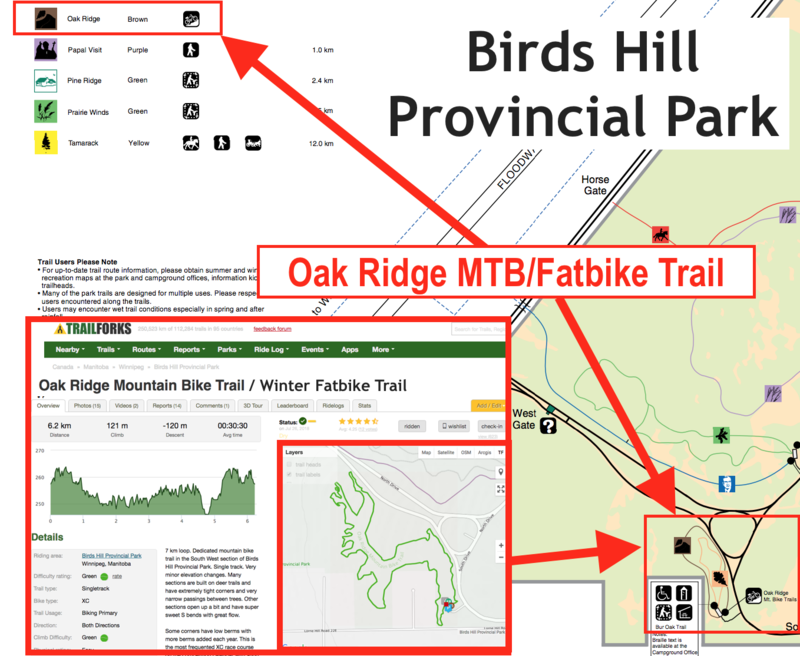 Oh yah, if you get ‘peck-ish’ after riding for an hour or so after the photoshoot, we have a chilifest arranged at a fatbiker friendly home near Kingston Park. 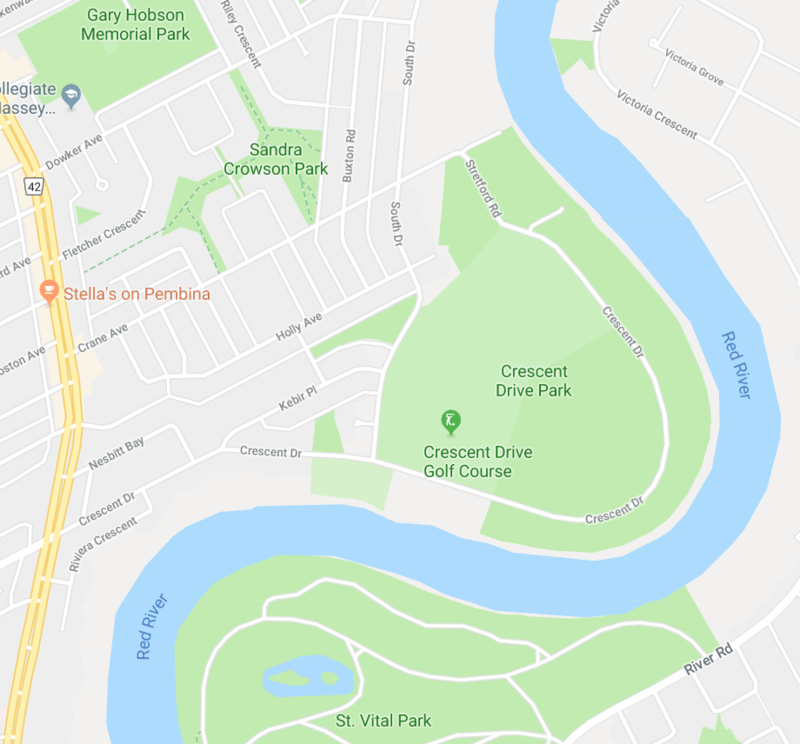 Afterwards, your can ride down Kingston Crescent to the Elm Park (BDI) Bridge and access the Churchill Drive Pathways and trails right back to the Forks (about 30 minutes).